The vastness of space, without some to experience it with, is transformed from something magical and awe-inspiring... into something empty and lonely. 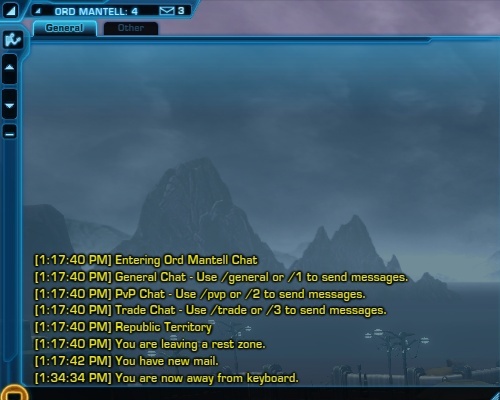 The SWTOR forums are filled with complaint threads about dead servers and players rerolling to higher-pop servers in order to continue playing the game. (And begging for transfers / mergers... or even just LFG.) Because the forums can be a negative place, I'd assumed that most of these posts were written by players who just weren't having much fun in the game. But I'm a data nerd, so I did some digging. I created characters on 22 different servers during Friday primetime. I selected 5 servers that were high pop, 5 low-pop servers, and 12 servers in the middle. On each server, I recorded the number of characters within 5 level brackets (1-10, 11-20, 21-30, 31-40, 41-49) and the number of level 50s. Before I start, I want to caveat EVERYTHING in this post with the observation that this is just an initial sample of data. I've got much more planned as I explore this topic. There are vast differences in the populations of servers. Just as an example, there were more Empire characters between level 11 and 20 on The Fatman server (420) than there were characters of both factions and all level ranges on Rwookrrorro, Thendys Noori, and Cho Mai combined (417). The smallest servers are empty places - averaging about 160 players total - compared to an average of well over 2000 players on the highest pop servers. Even more startling is that the data suggests players are migrating to the high-pop servers. The high population servers not only have more players, they also have more players rolling new characters. On most servers, approximately 1 in 3 of players online are level 50. On a top 10 server, that number shrinks to 1 in 5. High numbers of low level characters suggests a large number of either rerolling or new players on these severs. To give a sense of what being on a low pop server is like, here are the chat logs from 2 minutes on Ord Mantel on the highest population server - Fatman - compared to 15 minutes on a low pop server. This wouldn't be so alarming... except that participating in most endgame activities requires a large number of like-minded players. Even a simple Huttball match takes at least 16 players in the que. That is half to one-quarter of all the 50s online for the smallest server in my sample. A ranked WZ system on that server - or a 16-player world boss - is absurd. Small numbers become even harder when there aren't socializing tools in-game. While cross-server LFG is typically blamed for undermining server communities, when the community on a server gets small enough, the absence of a LFG tool isolates those players even further, ironically turning an MMO into an isolating experience. 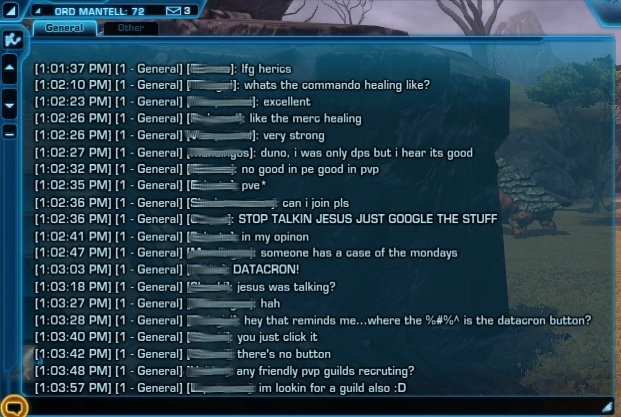 Worse still, imagine guild recruitment to replace someone in an operations group. Again, a word of caution: this is just a snapshot of a few (mostly pvp) servers. Until I have more data (working on it) the findings here are more intended to be thought-provoking and give a little more context to ongoing discussions about the state of SWTOR. That said, I really feel fortunate to be on a medium population server with a stable set of guildmates who remain interested in operations and endgame shenanigans. But for those who aren't, I hope Bioware resolves these issues... quickly. I definitely agree that a single day snapshot doesn't add much context to the server population hullabaloo - nearly any night has some feature that makes it odd (weekends, server resets, raid patterns...). Fortunately, we finished the raid early tonight, so I got to take a look at Friday vs Tuesday differences. Short story: the total number of players doesn't differ much between Friday and Tuesday... so the overall story about huge differences between server populations still holds. But the number of 50s online dramatically differs between the two days. I'm still sorting out the details, but an excellent follow-up post once I get it done.